Discussion in 'Football Recruiting' started by wadc45, Nov 1, 2010. RB Akise Teague (211) is listed at 5'8-174, but may be a stretch. However, he may the quickest, most explosive back that I have seen this fall. Tremendous hips and change of direction. Excellent burst. Excellent vision. In open field, he is extremely hard to bring down. Soft hands. Also can play CB. Actually believe that he is a threat to go the distance every time he touches the ball. And St V's defense is really strong. By The Bank...his coach says his grades are improving...also talks about what a great person he is, as well as tremendous football talent...calls him the second best player he's ever coaches behind Clarett (and ahead of guys like Turner, Manningham, Burgess, etc.). Last week, I told you to keep an eye out for RB Akise Teague of Youngstown Ursuline as his team took on Doran Grant and Akron St. Vincent-St. Mary. Teague didn't disappoint in that game, just as he hasn't all season long. So far in 2010, Teague (5-9, 180) has 2,504 all-purpose yards on 182 touches and is averaging 13.75 yards every time he touches the ball (10.3 per rush). Teague has 29 total touchdowns on the season -- one every 6.2 times he touches the ball. Teague's senior season has certainly caught the eye of some major programs. Teague's scholarship offers right now come from MAC schools, but Michigan State, Wisconsin, and now Ohio State are starting to show heavy interest. Ohio State quarterbacks coach Nick Siciliano is scheduled to be at Ursuline on Tuesday to check on Teague. GREEN -- From their slow walk up the field to take the sideline for the start of the game through the final play of the fourth quarter, Ursuline was all business. The two-time defending state champion Fighting Irish rolled over Norwayne 42-0. The Fighting Irish played as close to a perfect game as possible, piling up big numbers on the ground behind speedy Akise Teague. They gained more than 100 yards through the air and tossed a shutout at a pretty potent Norwayne team. "Tonight we felt like we had to come out strong running the ball," Teague said. "I just did what I had to do to get my team the 'W.'" "I was very pleased with the way we ran the ball," Ursuline coach Dan Reardon said. "I've been a coach a long time and I'm always looking for a perfect game. It doesn't matter if it's Week 1 or Week 15, we're looking to improve every single game." Teague finished with 179 yards on just 13 carries. "Teague is a special athlete" said Norwayne coach Joe Harbour. "He's the best athlete we've seen all year. For a little dude, he's got a lot of power. He runs with a lot of power and a lot of speed, which is a dangerous combination. And, he hits hard on defense." OSU offer coming for Akise Teague? Akise Teague's senior season figures to end with Teague winning Ohio's prestigious Mr. Football award and a third-straight Div. V state championship for Teague's Youngstown Ursuline team. His future might include playing at Ohio State. A source at Ursuline told FOXSportsOhio.com Monday that Ohio State coaches visited Youngstown late last week and that a scholarship offer could come as soon as this week. The 5-foot-9, 170-pound Teague is a bit of late-comer to the recruiting party but is having an outstanding season, having rushed for an unofficial count of 1,753 yards and scoring 35 total touchdowns through 12 weeks. Ursuline plays Kirtland in a battle of 12-0 teams this weekend for the Region 17 championship. Teague, who also stars at cornerback, might fit best at that position or as a slot receiver at the college level. He's undeniably a playmaker on both sides of the ball and has also accounted for more than 450 yards in the receiving game for an Ursuline team that runs a no-huddle offense and employs Teague primarily as a tailback but also uses him in the slot and as a kick returner. Last time I sent him some rep he complained about the ding! Duane Long did a post about Teague a week ago or so. Jim Tressel covets versatile players. I definitely see a Buckeye caliber corner. I see a Buckeye caliber receiver. I think he could be a Buckeye caliber back. If you want to argue that a player is worth a shcolarship just to return kicks, I see that in Teague too. A player that is worth a scholarship for each of those positions individually should be a no brainer for an offer when he can do them all. not rated to high among the main sites. This kid is a stud...Really hope we find some way to add him/get him in. I like him much more than Shane Wynn at slot. But I also think he could make a fine CB too. He may be 5'8ish but he plays with no fear. It was No. 1-seeded Ursuline against No. 2 Kirtland for the Div. V, Region 17 championship Saturday night. 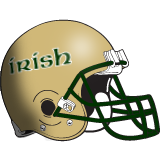 The Irish whipped Kirtland, 48-0, for its 13th straight win in 2010. Saturday?s game came on the heels of a 42-0 win over Creston Norwayne a week ago. Quarterback Paul Kempe threw for two touchdowns to Akise Teague and Kempe ran for another. Teague also ran for one as the pair led a powerful offense. Teague finishd with 199 yards on 17 carries, while Kempe had 119 yards on eight rushing attempts. Kempe was also 5 of 6 for 182 through the air. I hope somebody from OSU was there last night.